If the black captures in return (there's not much choice for black), you either get an open vertical e or a nasty attack on the black King by Qh5+ and so on. In general it is dubious to put too much faith computer evaluations of less than a pawn in determining the "best" move. In this position however I think serious thinking is required. Let's think like a human: Black has made a lot of pawn moves and is therefore behind in development. In such cases it is usually good to open the position. 6.exf5 (a) 6...exf5 enumerate candidate moves: (a1)7.Nd5 (a2)7.Bg5, etc. Things get complicated but you can see ideas based on Nd5 combined with Qe2+ and Bg5 can lead to difficulties for Black. It seems 6.exf5 looks promising, now does 6.Bg5 look as good? Well the computer gives 6...Bf6?! 1.5 to White so that doesn't make 6.exf5 better; and it says after 6...Ne7 7.exf5 gxf5. Hmmmm, on 6.exf5 it liked 6...ef5 -- because now exf5 allows Nd5. So we can force gxf with Bg5... is that what we want? Looking at these positions which are you more comfortable playing? That is the practical question. 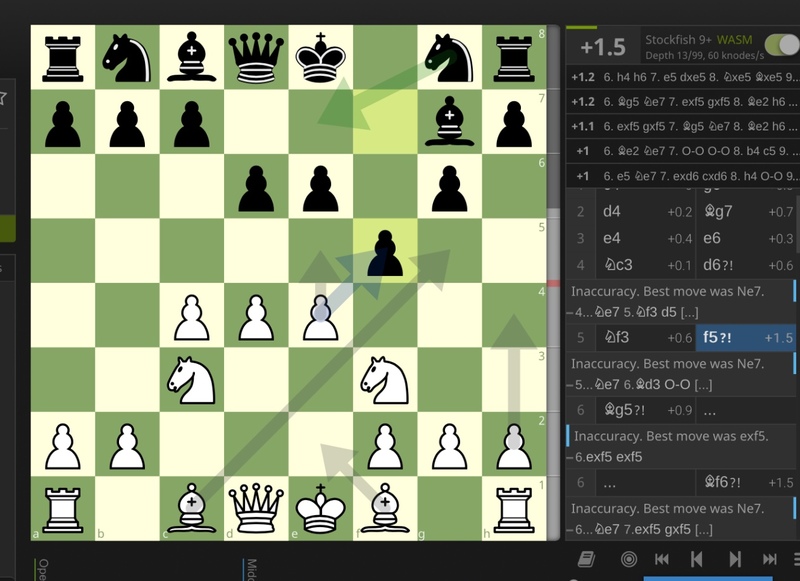 6.exf5 might be a fraction of a pawn better if you are a computer.